The multitude of worlds, realms and places that make up Nirvana are as varied as the people who play the game. The time frame can range from the far, pre-historic past to the ultramodern future and everywhere in between. The players who explore are rewarded with a wide variety of monsters, armors, weapons and items, not to mention the satisfaction of mastering the “lay of the land”. The basic “village” has remained mostly unchanged, so that familiar landmarks like the clock tower, church, post office or Adventurer’s Guild will always be in the same place. Below is a map of the main village spine which shows some of the major landmarks of the region. 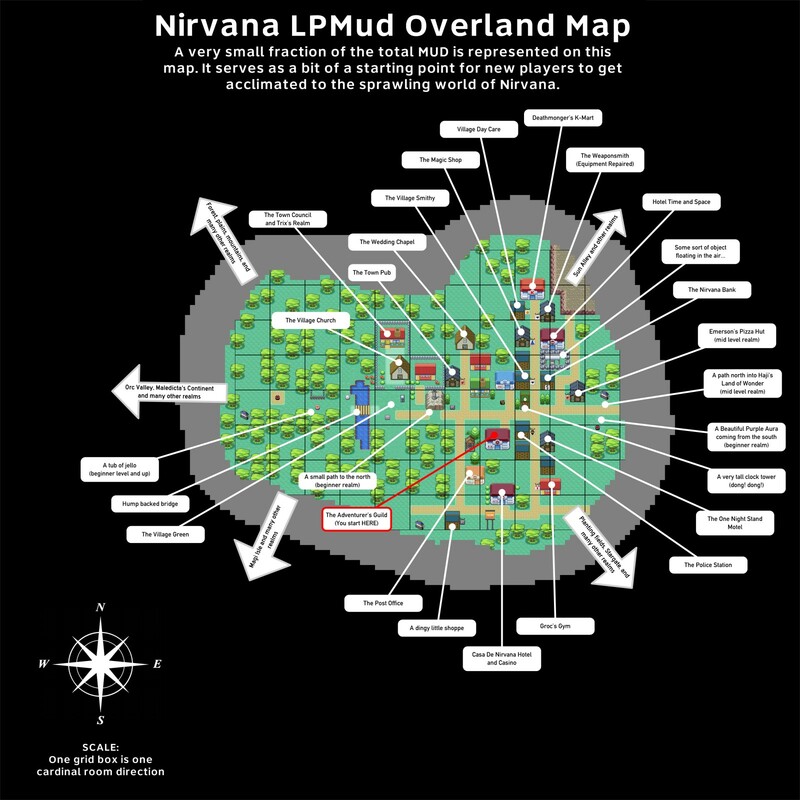 Please note that this map is only a small slice of the total playable terrain, and is meant to help familiarize the village area for new players. This is still a work in progress. Stay tuned for more, such as actual details and legends on the map! Now that you’ve got some equipment and have read the help files (you have at least looked at the help files, right? ), where do you go to get some experience and loot? For the most “up-to-date” listing of newbie areas to kill in, there is the old man west of the Adventurer’s Guild, but definitely also refer to other players’ suggestions. There are quite a few players who take great pride in offering directions, parties to combat, or even equipment to start off. What follows is a limited listing of areas designed to help the smaller players get some experience, equipment and coins.